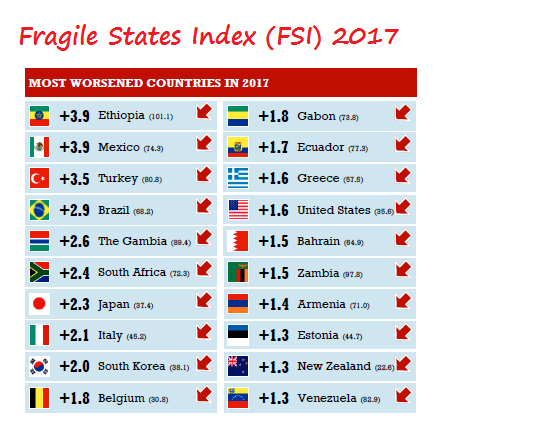 ETHIOPIA: The country’s Public Services score in the FSI has worsened from 7.0 in 2007 to 8.8 in 2017 – much of this is due to poor access to internet and communications, as well as limited improvements in water and sanitation facilities within the county. Health infrastructure also remains weak in many areas, with only 15% of births attended by a skilled health professional, and just 0.02 Doctors per 1,000 people within the populous country. 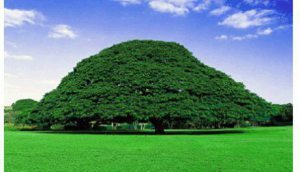 The highly centralized nature of the EPRDF means that the nine ethno-linguistic regions of Ethiopia have limited power and resources for provision of public services. The military also plays an active role in reinforcing the centralized development agenda – with much of the county’s development driven via the military-controlled conglomerate Metals, Engineering Corporation (METEC). As a 2016 report by Dutch think tank Clingendael surmised, this increases risks of “corruption, nepotism and inefficient resource allocation,”6 all of which can increase the disconnect between development and rural populations. 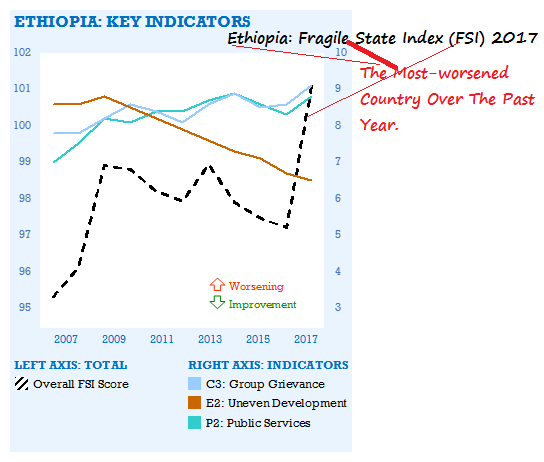 Some of this can be attributed to External Intervention, with its FSI score moving from 6.7 in 2007 to 8.7 in 2017, making it Ethiopia’s most worsened indicator overall for the decade. In 2000, Ethiopia received US$687.8 million in Official Development Assistance (ODA).1 By 2015, it had risen to over four times this with US$3.23 billion in ODA, mostly from the U.S., World Bank and European partners focused on social infrastructure and humanitarian aid.2 While this suggests low capacity of the state to plan and respond to natural disasters without external aid, arguably this development funding has also been crucial in stimulating the rapid economic trajectory of the country. Ethiopia’s economic indicators have both made improvements over the past decade, with FSI scores for Uneven Economic Development shifting from 8.6 in 2007 to 6.5 in 2017, and Poverty & Economic Decline from 8.0 in 2007 to 7.0 in 2017. While the economic trajectory tells one part of the story, the gap in public services between the urban areas such as bustling Addis Ababa, and rural areas – where 81% of the population still live3 — hint at growing disparities. The country’s Public Services score in the FSI has worsened from 7.0 in 2007 to 8.8 in 2017 – much of this is due to poor access to internet and communications, as well as limited improvements in water and sanitation facilities within the county.4 Health infrastructure also remains weak in many areas, with only 15% of births attended by a skilled health professional, and just 0.02 Doctors per 1,000 people within the populous country.5 The highly centralized nature of the EPRDF means that the nine ethno-linguistic regions of Ethiopia have limited power and resources for provision of public services. The military also plays an active role in reinforcing the centralized development agenda – with much of the county’s development driven via the military-controlled conglomerate Metals, Engineering Corporation (METEC). As a 2016 report by Dutch think tank Clingendael surmised, this increases risks of “corruption, nepotism and inefficient resource allocation,”6 all of which can increase the disconnect between development and rural populations. Click here to read more at the original source of the article.